MEXICO CITY | The president-elect of Mexico, Enrique Pena Nieto, said Tuesday Mexico should have a debate about legalizing and regulating the sale of drugs here, an approach advocated by some other Latin American leaders to take marijuana sale profits out of the hands of the drug cartels. “So let the debate begin, but you’re not taking a position yet?” I asked. The Obama administration has responded warily to such talk from its southern neighbors. Yet two weeks ago, the president of Uruguay sent just such a proposal to his legislature — for the government to effectively become the sole seller of marijuana — saying “the traditional [interdiction] approach hasn’t worked” and “someone has to be the first” to try it. On other points, though, Pena Nieto sent reassuring messages to Washington. He said his plans to refocus the drug war to reduce violence suffered by the Mexican people will not mean abandoning the pursuit of drug kingpins shipping vast quantities of drugs to the United States. Two weeks ago, at a House hearing, Rep. James Sensenbrenner, R-Wis., accused Pena Nieto of advocating “a reversion” to the old policies of “turning a blind eye to the cartels” as long as they weren’t perpetrating the grisly violence. It’s a message current Mexican President Felipe Calderon has been harping on. 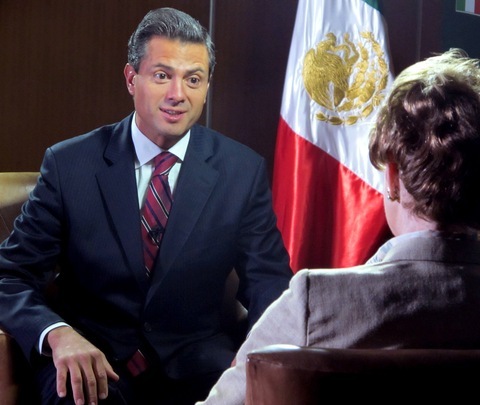 It seems clear President Obama is going to hear it from Mexico’s new president as well. ENRIQUE PENA NIETO: I believe that in our country, fortunately, we have democratic institutions that are very solid and reliable. We have electoral tribunals which will be responsible for addressing these issues and attending to these complaints, the ones filed by candidate Lopez Obrador. I am convinced that it was a truly exemplary process where more than 50 million – over 50 million Mexicans participated with a difference of more than 3.2 million votes. ENRIQUE PENA NIETO: I will maintain the presence of a Mexican Army, and the Navy and police in the states of the Mexican Republic, where the problem of crime has increased. We will adjust the strategy so that we can focus on certain type of crimes, like kidnapping, homicide, extortion, which today, unfortunately, have worsened or increased, because we have a lot of impunity in some areas. The state’s task is to achieve more efficiency, and to go back to the rule of law and enforce laws strictly in our country. ENRIQUE PENA NIETO: This is an issue that has been surrounded by a high level of debate. And we have insisting on getting the U.S. more involved in fighting arms control. Unfortunately it has had no impact. The problem has killed thousands of Mexicans, unfortunately. And it is an issue that, without a doubt, is unsolved yet. We have not seen a good level of efficiency by the U.S. in terms of better controlling arms trafficking – I’m talking about high-caliber weapons – into our country. ENRIQUE PENA NIETO: I’m fully convinced that the PRI (his Institutional Revolutionary Party) — on this effort to promote competitiveness, more credit, fighting monopolies and pushing the energy reform I’m committed to — that the PRI will push it, will allow it to gain more social support. And that will also allow my political party to increase its capacity to push these initiatives. It is clear that in order to achieve this objective, we will have to reach agreements with our political forces to be able to push these reforms, to participate and become part of this effort to modernize our country. View all of the NewsHour team’s Mexico coverage.